I watched my wife with a critical eye as she moved the iron back and forth. “I do wish you’d find something else to do!” she complained. I picked up the sock she had just ironed and ran an expert eye over the crease. Satisfied, I placed it neatly on the “done” pile and watched her iron its companion. I handed her my Mr Messy underpants without bothering to answer. She gave me an exasperated look before shaking her head and adjusting the iron. “And don’t put the crease through Mr Messy’s face, like you did last time,” I warned. The doorbell rang and I went to the window to peer through the net curtain. An unfamiliar car offering no clues was parked in the drive. I went to the front door and opened it, beginning the routine speech. With the door now fully opened I found myself confronted by Ed Balls. He looked a little taken aback. “Badders?” he asked, a little uncertainly. 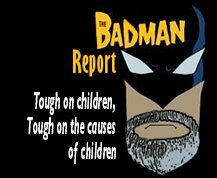 (I do wish he wouldn’t call me Badders). “Yes, of course.” I ushered him in, glancing up and down the Avenue to see if we were observed. I guided him into the sitting room and indicated a chair. He waited until I was sitting, peering at me through those bulging little eyes of his. He stared unblinkingly at me with those pop-eyes. Although my expertise might not extend far into the world of the medical profession, I know an over-active thyroid when I see it. “Yes, that’s what worries me. I ran into one of your neighbours just now. I wanted to make sure I got the right house. You know, the elderly lady over there? It looks like she is building a wall. Quite a high wall actually. She started to twitch when I mentioned your name. Almost like a nervous tic. She pointed at your door, but never uttered a sound. She did make a funny little ‘O’ shape with her mouth, then she scuttled indoors. I must say she moved surprisingly quickly for someone with a breeze block in each hand.” He stared thoughtfully out of the window for a moment. “Yes well, she’s a bit funny,” I said, tapping the side of my head. “Thing tied to the tree…?” I had no idea what he was talking about. 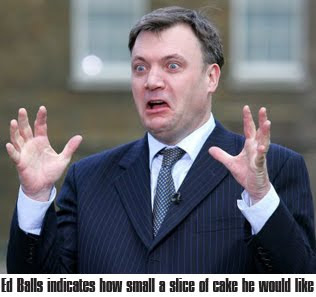 Ed Balls jaws were working silently as if he didn’t quite know what to say next. “Have you?” His eyes bulged even more alarmingly. I hurried out of the house trailing the portly MP behind me. As I rushed at Smith he recoiled slightly. Turning to Ed Balls, his jaw visibly dropped. “And you think that makes it acceptable do you?” Ed Balls demanded. “Smith, I am appalled!” I joined in. Miranda had spotted me and came skipping over to join her father. Ed Balls leaned down to Miranda, “Is that the sort of computer game you’re playing?” he asked. She looked horrified and shook her head. “Jack and the Beanstalk…” she uttered softly. Ed Balls gave me a pained look and patted Miranda on the head. Smith cleared his throat forcefully. Smith muttered something that sounded like “two legs good, four legs bad” but I couldn’t be sure. At that moment I noticed the Rev. Thomas doing his rounds with the Parish news sheet. Spotting me he hesitated a moment, seemed to gather himself and then called out. Ed Balls was suddenly interested. “You were rude to a vicar?” he asked. The Rev. Thomas suddenly jumped visibly and turned stricken eyes to me. Whatever was the matter with the man? I began to correct him a second time when I noticed he was pointing at the tree next to the driveway. “Norman…!” he said again, his voice trailing away into a small sob. I suddenly remembered what Ed Balls had said about something being tied to my tree and took a hesitant step forward. With a sense of foreboding I forced myself to look up where the Rev. Thomas was staring. Icy fingers of dread were once more playing on my spine as I had the horrible feeling that I already knew what I would see. There, gaffer-taped to the front of the tree trunk were the desiccated remains of a certain guinea-pig. Its brief sojourn in the wheelie bin had done nothing to improve its appearance. It now appeared to be slimed with mayonnaise and wore a glace cherry on one withered paw like a tiny boxing glove. Ed Balls and Smith both joined us and we all regarded the grotesque little display in silence. After a moment, Smith became quite animated. “It’s a guinea pig,” Rev. Thomas and I snapped back in perfect synchronisation. He looked at me curiously. “How can you tell, in that state?” Ed Balls asked in wonder. “Because it’s MY guinea pig!” Rev. Thomas cried plaintively. “My poor little Norman! He’s been missing for weeks. Someone took him from his run in the garden. I never imagined I’d find him like this! What sort of person…” he began. To my alarm he was looking at me. I pointed at Smith. “There’s a note, look!” said Ed Balls. At the bottom of the tree, caught between the trunk and the wall was a piece of paper sporting more gaffer tape. It had obviously been originally stuck to the tree as well, but had since unpeeled. I tried to grab it, but Ed Balls beat me to it. “It’s a formal warning.” He said. “Your dustmen are saying if you ever leave anything like this in your wheelie bin again you will be prosecuted.” He handed the note to me and I took it with fingers of lead. My blood seemed to have congealed to the consistency of porridge and I wasn’t sure how to breathe anymore. “Autonomous Ed!” I blurted out. Ed Balls cleared his throat. “I think you better explain yourself, Badders.” He said sternly. “Let’s go inside, Badders,” said Ed Balls. “Come on.” He began pulling my arm in the direction of the house. Smith and Rev. Thomas simply stared. “Come along, Badders!” Ed Balls said more forcefully, pulling my arm quite hard now. I was being dragged to the door which my wife was holding open, a worried expression pinching her features. “This isn’t fair…” I told her in a quiet miserable voice as the door closed behind me. From the kitchen doorway, Autonomous Ed began striding down the hall towards us. “YOU!” I hissed through clenched teeth. Autonomous Ed froze, alerted to danger by that supernatural cat sense. He swished his tail but began backing away. Tearing free from Ed Balls grip I flung myself after him. He yowled and scooted across the kitchen tiles while I chased round the table with a whisk snatched from the utensils pot. “You just wait… I’ll fix you if it takes me five years.” With a final spit of fury, Autonomous Ed dived through the catflap as I tripped over the table leg and lunged. Some time later I lay looking up as the retreating sun spilled gold across the early Autumn evening. I inhaled a deep breath of crisp fresh air and held it. It was cold, an advance warning of the frosty nights ahead. I exhaled slowly and closed my eyes. Tried and tested relaxation methods had taken their time, but my pulse was almost back to normal. I opened my eyes as my wife joined me outside carrying a cup of tea. I took a sip of tea and let go of the straw. “My nose is cold!” I moaned. We remained in silence for a while, me sucking tea through the straw, she staring into the middle distance wistfully. “You did tell them the real story of what happened with that guinea pig, didn’t you?” I asked for the sixth time. As she disappeared from my restricted field of vision a thought struck me and I called after her. This is my favourite blog ever!